We’re around the mid-point of the round robin part of the 2018 World Cup, some teams have already been eliminated and others are clinging on desperately. Here are some thoughts from the last week of the competition. I can’t believe that in 2018 this is still a thing, but it is, and we should talk about it. International tournaments have always lit the fuse for small-minded bigotry based on foreign stereotypes, but the vocal minority have reached a new low. I assume/hope this is isolated to British fans only. International friends; your mileage may vary. To add a different voice to the traditional punditry party of XY chromosomes, ITV have brought in former Chelsea and England player Eni Aluko, while the BBC have former Arsenal captain and England player Alex Scott. A pair who between them have over 240 caps for England. Both have been added to provide opinion, but have ended up dividing it for all the wrong reasons. The reason for this is that they are both women, providing opinions on a men’s tournament. Names removed to avoid free advertising. Football punditry has long been ‘jobs for the boys’ (if you’ll excuse the pun), former players and managers turned talking heads to fill time with insight based on their days on the field. While experience and knowledge counts for something, you also need to be able to communicate well and be, well, interesting. You can read the rest of that quote here. If you want. 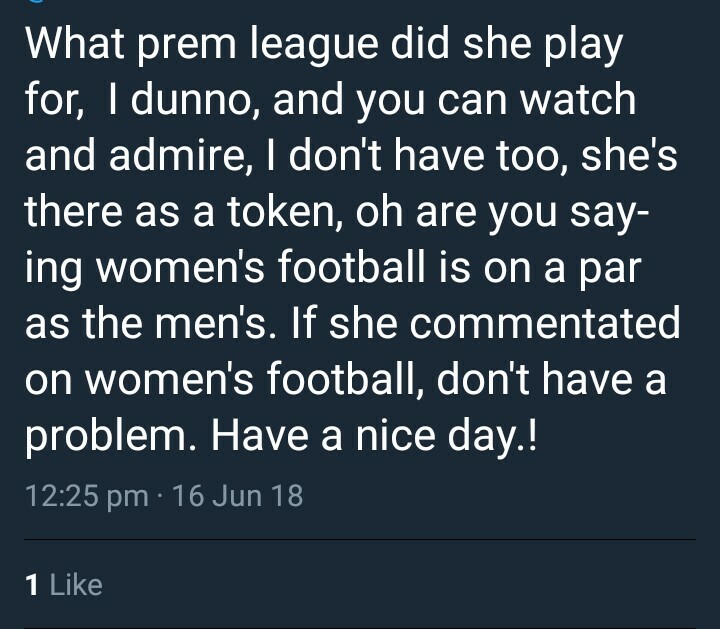 While it’s true that men’s and women’s football isn’t the same, this is limited only to the inescapable fact that they are played by different genders. Aside from that, there’s no difference. The rules are the same. There’s a slim parallel to be drawn with the NHL and NWHL here, like hockey’s Amanda Kessel, Aluko’s brother Sone has also played at the highest level, yet when Kessel chimes in with opinion on Men’s hockey, there is no real backlash about her opinion being invalid because she’s a woman. Pundits fall into two categories, good, and not good. Scott and Aluko both firmly fall into the ‘good’ camp, and that’s the only opinion that should matter. It’s 2018 after all, although somebody should tell Lawro that. In a weird turn of events, five time winners Brazil failed to beat Switzerland and Germany lost to Mexico in their opening games. We’ve already talked about how Iceland held Argentina, and fair play to all of those teams that upset their established, higher ranked rivals. The reactions within those teams’ fanbases have been understandable. Mexico fans lost their minds, which considering that Mexican national team has never progressed past the quarter finals is exactly the right reaction. Had my team (England) beat the current champions, I’d be having a mini freakout. What’s unusual is the response from fans of other teams. These generally fall into two camps; the first is ‘calm down Mexico, you only won one game’ while the other is ‘Germany lost to Mexico! Their tournament is over!’ Two opinions, poles apart, that are doing the rounds at watercoolers across the lands. With the eyes of the world watching, the World Cup attracts the highest level of scrutiny and inevitably the most polarising opinions. The world needs to take a step back and enjoy the tourney for what it is. Let the Mexican fans enjoy their day in the sun. They earned it. Germany losing their opening game isn’t the biggest story in the competition. In 2010 Spain lost their opening game but still won the cup, the Germans are still in with a good chance. In an unsurprising twist, both Germany and Brazil won their second game, although Sweden made the champs work hard for the three points. In the dying minutes of Iran’s 1-0 loss to Spain, winger Milan Mohammadi went for the spectacular. Deep in the opposition’s half, Mohammadi kisses the ball, points to the sky… then does a somersault throw… except he doesn’t. After a mid-roll change of heart, the winger pulls out of the maneuver and throws the ball the wrong way. Don’t expect this to go away any time soon. Jump to 50 seconds in. There are just no words. 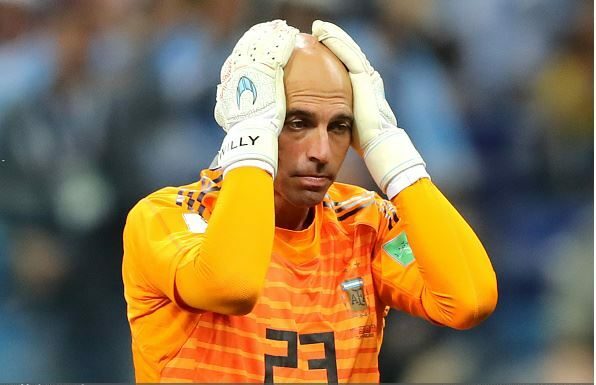 What have been your favourite moments from the World Cup so far? Comment below or join in the conversation on twitter. Previous Post: What Should the Montreal Canadiens Do with 3rd Overall Pick?